STOCKTON, CALIF. — The third-ever USA Roller Sports roller derby national championship wrapped up this past weekend. 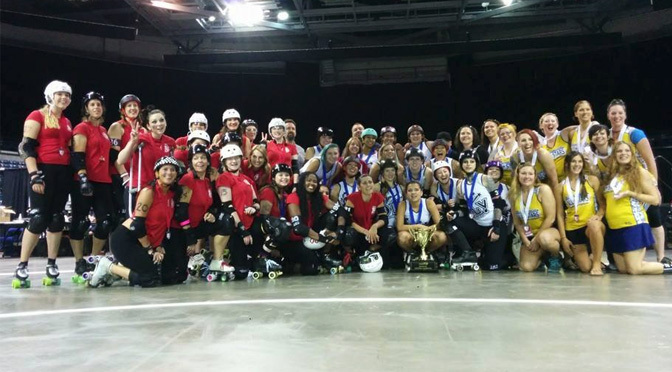 Once again, the Oly Rollers of Olympia, Wash. are the USARS national champions, taking three Seltzer Cup titles out of three chances to do so. Antagonist Roller Derby (Seattle, Wash.) finished second, and the Pennsylvania All-Stars finished third. Due to cancellation of the three regional qualification tournaments, the scatter-shot skill level of the eight teams that chose to participate and their random distribution within the bracket meant that there were going to be a lot of very poor matchups. That showed on day one, where the six games had an average final score gap of 140 points—a very, very large margin of victory in USARS play. Day two was noticeably better, as teams started to level with each other. The first contest of the day saw Antagonist and the PA All-Stars go down to the wire, Pennsylvania holding on to win in a last-jam thriller, 76-71. Many crazy amazing things happened in this game. Holy crap Alyssa Pray just destroyed it, winning a jam 13-4 after both jammers emerged equally. Spin moves, hip whips, great defense. Wowza! 75-65, 4min left. King got 2 but then got LEVELED. Barely made it back in bounds to call it off before V-Diva swiped lead jammer. That's it! Game over! Skinny Guinea nabs lead and takes the jam 3-2 to win the game for Pennsylvania. Wowowowowowow what a gamamamame! Later, tourney host Port City Roller Girls (Stockton, Calif.) played in a very entertaining game against the Chicago Red Hots. The 93-39 final score1 doesn’t tell you how competitive the affair turned out to be. Except for one 10-point jam in the second half, neither team could manage to earn more than one scoring pass against one another. Single-pass scoring in games between even opponents ruled the weekend, although not without issues. USARS is still developing its roller derby rule set, and Antagonist found a sorta-loophole that made many of their games hard to watch. By racing the pack and allowing the opposing team to fall behind the pack and out of play, their jammer just needed to pass one opponent to pick up the remaining three out of play points ahead of her. This strategy was only most effective against Port City, a team with blockers that are better at hitting hard than skating fast. The 69-50 final score mostly reflects the amount of time it took for Antagonist to get their points on many jams. However, the first time Antagonist played Pennsylvania, their “passive offense” tactic cost them the win—there were at least four jams in the first half where they had lead status and front pack position, but did not slow the pack down to attempt to score points against an equally-fast opponent. Those missing points hurt them in the end. Not so much in first game on Sunday, where the two teams rematched. After the Pennsylvania roster was depleted to 10 players due injury, Antagonist ran circles around them and led 35-3 at halftime. A heroic second half effort (and some help from a more favorable bench/start position) saw a tired PAAS almost win the second half, but ultimately lose the game 62-28. The result still earned Pennsylvania the bronze medal, however. Very fun, very competitive co-ed games2 started the day and filled the break before the championship final. The first, a black/white scrimmage, ended 92-72. The showcase game, featuring many top USARS speed, artistic, and derby skaters, saw a final score of 88-71. The last game of the weekend was the Seltzer Cup final. Antagonist Roller Derby was to face the Oly Rollers. Oly had breezed through their first two games, 205-27 vs. Port City and 249-9 vs. Chicago. Oly’s third game against Pennsylvania didn’t give them much trouble defensively, but they had to work for it a little bit offensively, scoring 122 points to PA’s 19. In the final against Antagonist, it went the same way. Although Antagonist put up a very good offensive showing, Oly dominated on offense and defense. You’ve got to do both in roller derby, and the Oly Rollers proved that, on this weekend, they were the best at doing it. They took home the Seltzer Cup yet again with a 150-34 win. Antagonist finished second, an improvement over their bronze medal placement last year. Kola Loka of the Chicago Red Hots earned tournament Jammer MVP honors, and Vanessa “V-Diva” Sites of the Pennsylvania All-Stars was named the Blocker MVP. USARS had initially planned for there to be a 4-team co-ed championship, but was scrapped after no teams had entered.